2018 NEWS: I am currently see clients for sessions on a limited basis. I may be available for special events. Feel free to contact me. Sound and vibration have both been used for centuries to soothe, uplift and heal. 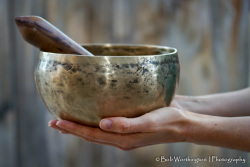 Serenity Sound Healing uses Tibetan singing bowls, bells and other instruments to allow healing to occur, be it physical, mental, emotional or spiritual. In a healing session you will be immersed in the vibrations and sounds of traditional healing instruments as you enter a deep state of peace and relaxation. Please explore the Serenity Sound Healing website to learn more, and contact me with any questions you may have, or to set up a healing session.